Would you like to have in your repertoire even more killer effects that you can perform anytime, anyplace and without any props? Then rejoice! 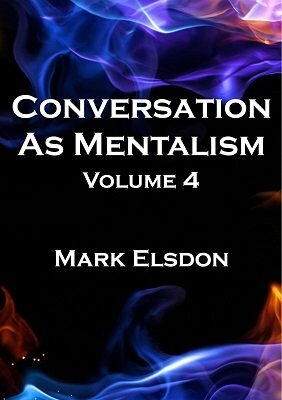 Mark Elsdon's new Conversation As Mentalism Volume 4 is just what you're looking for. You will learn a brand new imagination-game using a borrowed finger ring, a dream sequence where the participant reads your mind, a way to hypnotize your shoe (! ), an unbelievably entertaining prediction from mouth, an incredible over-the-phone revelation and much more! All new, incredible effects that have been designed with one outcome in mind - to amaze whoever you are talking to without the aid of any gadgets, gizmos or gimmicks. Conversation As Mentalism 4 once again teaches pure, propless mentalism at its most organic.